Fortress moms Tiffany (l) & Michelle (r) utilize the Parent Resource Center. Equip, the parent engagement program at Fortress, began as a Junior League Fort Worth funded project in 2014. The positive feedback we received and the powerful relationships we formed during that pilot year prompted us to launch Equip as a mandatory program for the parents & guardians of children enrolled in Fortress programs. Equip requires each family to invest a minimum of 12 hours each year back into the Fortress programs. Research tells us that parent involvement is an indicator of future success for students in low-income households, and our goal is to empower our parents to become more involved in their child’s academic and social-emotional growth, and to discover opportunities for growth in themselves. Parent hours can be completed in a variety of ways. On average, Fortress offers 120 hours of parent engagement opportunities annually. The majority of these opportunities are through ongoing classes during the fall and spring semesters. Fortress mom Nakesha graduates from Financial Peace University. ENGAGE: Positive Parenting Initiative (Monday mornings). This parenting curriculum, created by Karol Ladd, uses a discussion-style format to strengthen and enrich the parent’s responsibility in the home. Designed for parents in areas affected by poverty or adversity, ENGAGE’s participatory initiative empowers parents to create practical action steps and encourages engagement with their children. Connect & Correct (Thursday evenings). Based on TCU’s Trust-Based Relational Intevention (TBRI), Connect & Correct explores parenting through a trauma-informed lens. Parents are encouraged to explore their own histories to discover the strengths and insecurities they bring into their relationships with their children. Focused on meeting the relational and physical needs of the child as a preventative for disruptive behavior, Connect & Correct turns conventional parenting on its head and challenges parents to push themselves and their families toward holistic, healthy relational habits. Financial Peace University (weekends, times vary). Dave Ramsey’s world-acclaimed financial management program and lifestyle is the newest addition to the Fortress parenting class lineup. The nine-week series explores the emotional and spiritual motivations behind money management, and introduces participates to baby steps that guide them to true financial peace. Parent hours can also be completed through participation in a myriad of other events and opportunities we offer throughout the year. Family Fun Events – including our annual Back 2 School Bash (August), Trunk or Treat (October), Family Christmas Party (December), Valentine’s Karaoke Party (February), and Literacy Carnival (June) – give parents a fun and structured environment to connect with their children on “their turf”. Volunteer opportunities at family events and in Fortress programs encourage buy-in from parents who invest their time and energy to help our programs run smoothly. Involvement in community activities – such as Meet the Teacher night at the local elementary school and Neighborhood Association meetings for the Historic Southside community – help parents find their voice and empower them to continue their involvement beyond their time at Fortress. In addition to the 12 required hours, parents must complete two conferences each year with a Fortress staff member: one orientation session at the beginning of the school year and one in-home meeting in the spring. 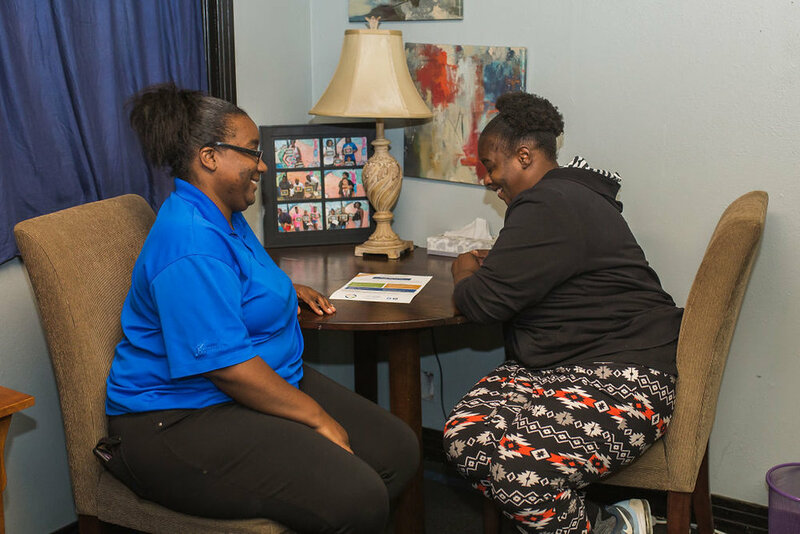 These conferences allow time to give and receive valuable feedback about child performance, assess family needs, and give parents face time with the Fortress staff. Fortress mom Michelle wins the award for 2018 Outstanding Parent Volunteer. Fortress mom Tasheka and her children Jaidah and Jordan pose with Santa at our Family Christmas Party. 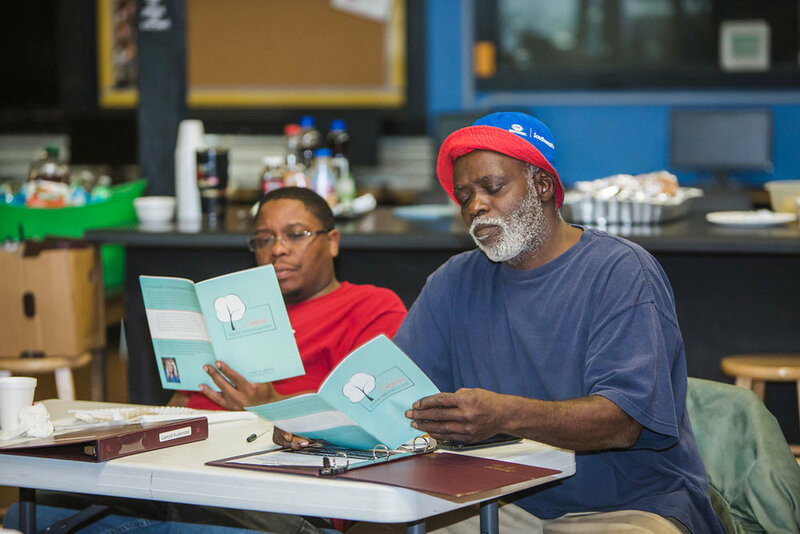 Fortress dads Lamont (l) and Gerry (r) participate in ENGAGE parenting class.